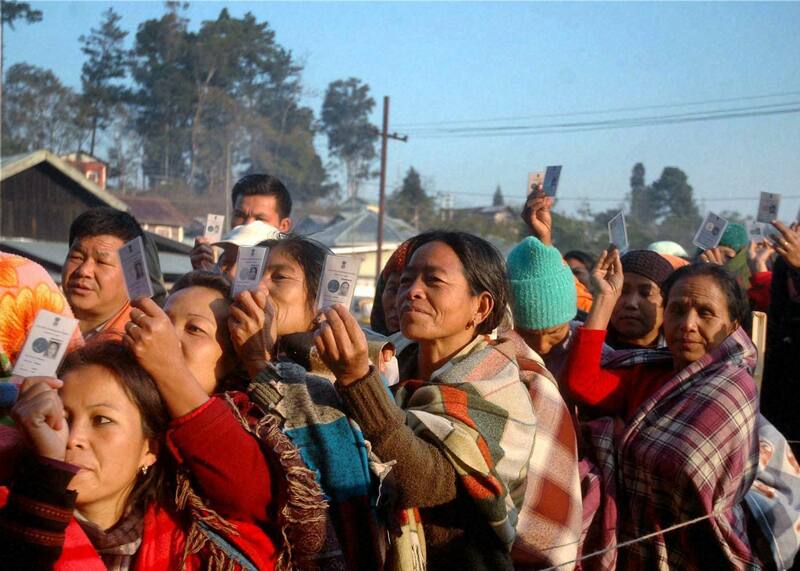 Imphal/New Delhi: An estimated 82 per cent of the electorate on Saturday exercised their franchise in Manipur assembly elections which was marred by militant violence that claimed seven lives, including that of an ultra. Chief Electoral Officer PC Lawmkunga said as per preliminary official reports, 82 per cent of the 17.50 lakh electorate cast their votes even as details from the state’s nine districts were awaited. Deputy Election Commissioner Alok Shukla said in New Delhi that a person, posing as a voter, entered a polling station in an interior area in Sugnu assembly constituency in Chandel district at around 12:30 pm and started firing indiscriminately, killing a CRPF man, three polling persons and a voter on the spot. An injured voter, who was taken to Imphal in a helicopter, succumbed to bullet injuries. The shooter, who is yet to be identified, was gunned down by CRPF personnel posted at the polling booth. Bombs suspected to have been planted by militants were seized and defused before the start of polling in Khurai Chingangbam area, Sawombung High School, Khomidok in Imphal East district and Naoremthong High School area in Imphal West district, official sources said. There were also reports from six other places in the state where mobs damaged Electronic Voting Machines (EVMs) and in another incident miscreants snatched an EVM, said Shukla. Two CRPF personnel on poll duty were killed in an ambush by militants in Ukhrul district on Friday, the sources said. Alok Shukla said the final poll percentage would be available only after receiving details from across the state. As polling continued till late due to long queues inside polling booths, election officials hoped the turnout would be higher. Saturday’s voting saw the fate of Chief Minister O Ibobi Singh (Thoubal), Forest Minister and Congress leader Th Debendra (Jiribam), Congress nominee and Speaker I Hemochandra Singh (Shingjamei), former chief minister and NCP chief Radhabinod Koijam (Thangmeiband) and Manipur people’s party (MPP) leader and former deputy chief minister L Chandramani Singh (Patsoi) sealed in EVMs.